From the moment new signing Charlie Adam was introduced in Saturday’s game against Wigan, Stoke played with increased creative energy. We carried the game to the opposition and showed much more fluidity. Even at this early stage we could all see that Charlie can provide that craft and guile we’ve been looking for. Combine that with his natural tendency to be industrious and cover ground, we may have finally found the missing link in our evolution. It could prove to be a masterstroke from Tony Pulis. The first half was tale of two penalties, both correctly awarded. Having got to half time on level terms it was infuriating to again fall behind early in the second half to such a sloppy goal. Our defence got dragged all over the park. It was a decent finish by Di Santo but from our perspective it was catastrophic that he managed to get such an opportunity. 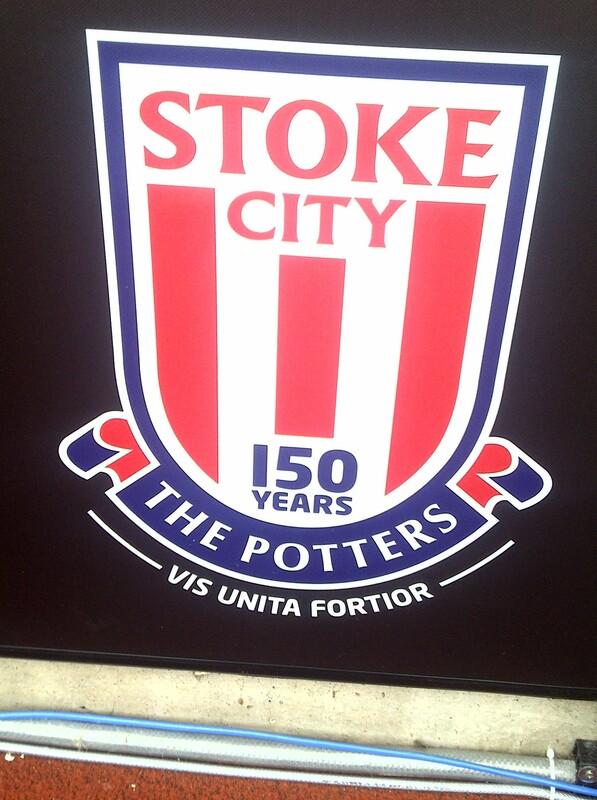 For a side like Stoke, known for defensive organisation, it was an awful way to fall behind. To our players credit they drove forward in search of the equaliser. The deserved leveller eventually arrived in the 76th minute through Peter Crouch. It was pleasing for Crouch to get on the score sheet as so far this season he’s rarely had a sniff of goal. However, Saturday proved that with service he’s still a huge asset and our most likely scorer. The remainder of the game saw us pressing for the winner. We’d have snatched the victory but for Ali Al Habsi’s remarkable reflex save from Charlie Adam’s free kick. All in all a draw was a fair result. Most pleasing is that in Charlie Adam we finally have a playmaker. A refreshing performance from The Potters. Cristiano Ronaldo scored twice for Real Madrid but celebrated neither goal. After the game he told the press “It could be because I am a bit sad. That is the only reason. When I don’t celebrate goals, I am not happy.” Predictably, his words sparked a barrage of intrigue. Is he trying to manipulate a transfer? Unless he’s prepared to take a pay cut there may only be two clubs in the world who could afford him. If Paris Saint Germain aren’t prepared to splash out he could be moving back to Manchester… and he wouldn’t be wearing red this time! Bizarrely, head of UEFA Michel Platini has welcomed the influx of QSI (Qatar Sports Investments) money to PSG. This is in contradiction to the financial fair play rules he’s instigating. Platini and Qatar seem to have a thing for each other. Platini also voted for Qatar to host the 2022 World Cup. Platini and Qatar could be seen as a love wholesome and pure… until you remind yourself that Laurent Platini, son of Michel, is QSI’s legal advisor. Platine was a truly great player but once he became a powerbroker he dipped his head in the trough…. just like the rest of them. Newcastle manager Alan Pardew has received a two match touchline ban for pushing assistant referee Paul Kirkup. Two matches is remarkably lenient. Since the incident Pardew has been humble and apologetic but manhandling officials should be treated with utmost seriousness. Referees should unite and take action about this episode. Attention now turns to the forthcoming World Cup qualifying matches. England’s preparation has been disrupted by injuries to Wayne Rooney and Andy Carroll. Roy Hodgson took the odd step of choosing not to replace Carroll in the squad. Rooney’s absence could be a blessing in disguise. Statistics show that England are more likely to win without Rooney in the team. Since illuminating the the 2004 European Championship, Rooney has played in three tournaments and made little impression. While few would doubt he is the outstanding English player of his generation, at international level he can’t be trusted to deliver. One factor is everything England do goes through him, which seems to inhibit his colleagues. There is a precedent we can reflect on. In one of his early press conferences as Spain manager Luis Aragones was forcefully questioned about the omission of Raul. Aragones reached breaking point and asked the gathered media how many tournaments Raul has played in and how many of them had Spain won? When the answer was that with Raul Spain had won nothing Aragones turned the questions back on his inquisitors by demanding to know why they insist on Raul. That was one of the pivotal points that turned Spain into football’s dominant power. If the games against Moldova and Ukraine go well, and Rooney is fully fit for the qualifiers in October, Roy Hodgson would be wise to copy Aragones’ strategy. It’d be a huge decision but management involves making those decisions. Reputations alone shouldn’t make an automatic starter. Fabio Capello‘s Russia start their campaign with a match against Northern Ireland. Capello sat down with Andrei Arshavin recently to tell him he would be continuing as captain. When the squad was announced Arshavin hadn’t been selected. Following the ongoing traumas in his previous job it does raise the question…. what is it with Capello and captaincy? England have reached the quarter finals of the 2012 European Championship. Surprisingly, it was achieved by winning the group. Seven points from nine is a very healthy return. The prospect of Wayne Rooney’s return from suspension dominated the build up to the Ukraine game. Before the match Roy Hodgson had to consider all options. Would it be wise to break up the forward line that beat Sweden? In his autobiography Gary Neville states clearly that insisting on accommodating big names has been a fault of England managers. Aragones’ omission of Raul was the pivotal point which led to Spain’s recent trophy haul. And, of course, in 1966, Alf Ramsey chose to continue with Geoff Hurst leaving a fully fit Jimmy Greaves on the sidelines. Few would suggest Hurst was actually a better player than Greaves, but for the good of the team, the manager made a bold decision… which proved priceless. In picking Rooney to start Hodgson must have been aware of these factors. When it was Rooney who missed the best chance of a tight edgy first half Roy could have been forgiven for feeling let down by his big name striker. Quite simply, he should have scored. Thankfully he redeemed himself by being on hand to score the winner shortly after half time. Although, it’s fair to say he couldn’t miss from there! Not a memorable goal but the fact is that when England clinched top spot in the group we beat Ukraine 1-0 and Wayne Rooney scored the winner. And Roy’s decision was justified. England play Italy next. If we were to progress to the semi final it would be regarded as something of a suprise by planet football. The point has to be made however that we have already achieved more than many expected in this tournament. Our progress has underpinned by preparation and application. Unlike in other tournaments this England squad seems to be focused on the job in hand. It’s pleasing that Hodgson’s experience and wisdom has removed the circus that surrounds the England set up. Another aspect is that the build up to the tournament was low key. No overblown statements or bombastic posturing… from fans press or players. This time we are aware of our failings and have finally scaled down expectations accordingly. Why are England traditionally dogged with such ridiculous levels of expectation? There is absolutely nothing to justify the notion that England are a superpower. Our record since 1966 isn’t great. In the last 46 years we have reached a World Cup semi a Euro semi and several World Cup quarter finals. In the same period Holland have reached three World Cup Finals semi and won the European Championship. Bulgaria got to a WC semi. Sweden have got to a WC semi and a Euro semi. Poland reached a WC semi and finished 3rd in 1974. Belgium have reached a Euro final and a WC semi. Turkey have reached a WC semi and a Euro semi and, of course, Greece were European champions. That’s only the middle ranking European sides. Since 1966* our record, when compared to other European football nations, gives new meaning to the word average. Yet English people get annoyed because, for example, ‘We’ll never ‘win anything with Capello.’ Or, ‘We’ll never win anything with Sven’. Its unlikely we’ll win a competition whoever the manager is. We’d all love to but to actually expect England to win a tournament is based on wishful thinking. There is no great tradition to justify a demand like that. We should keep our hopes in perspective. When we are knocked out of this tournament will we see the same filth and fury that often accompanies an England exit? I’m certainly not saying we shouldn’t try to win tournaments. But I am saying we should keep our hopes in perspective. Personally, I always look at getting through the group then take it from there. Usually as soon as we face a side with genuine aspirations to win the tournament we get knocked out. 1990 was great fun but, with all respect, Belgium and Cameroon weren’t contenders to lift the trophy. *Our record before 66 wasn’t great either…Bela Horizonte anyone? On the subject of genuine football superpowers I believe Germany will lift the trophy. To now they been the best team in the competition. While every team in a tournament like this will cause problems they will know it could have been a harder quarter final than Greece. Sixteen years without a trophy will be hurting. For a nation of their football stature it’s too long. It’s worth pointing out that in these sixteen years they have reached a World cup final and a European Championship final. Nicklas Bendtner has been banned for one match and fined 100,000 Euros for showing the sponsored waistband of his underpants. Bendtner did indeed break rules but the real story is that UEFA have made it abundantly clear by this that they regard upsetting sponsors as a bigger evil than the racism which is endemic in some nations. The Croatian FA has been fined a lesser amount for their fans racist chanting at a Euro 2012 match. UEFA and FIFA have both been in a strong position to take decisive action on racism for years yet they continue to shy away. Hopefully the ruling bodies will be spare us any glib fatuous statements about global harmony. Litany of errors though it undoubtedly was, beating Sweden is a huge step towards the quarter finals. It was a strange match in which neither team actually played with cohesion or incisive power. The second half must have been a thriller for neutrals. Infuriating for England and Sweden fans but thrilling for neutrals! Roy Hodgson acknowledged before the game that England needed a more attacking set up against the Swedes. It wasn’t a major shock to see Andy Carroll start the game. The inclusion of Carroll was due to Sweden’s inability to defend against crosses. This observation proved to be unfathomably wise when Carroll’s brilliant glancing header put us ahead. It also silenced the doubters who have felt aggrieved by the exclusion of Peter Crouch. The only problem with Carroll’s involvement is that it is too tempting to hit long balls to him… long balls that too often get comfortably dealt with by the opposition. The start of the second half was calamitous for England. For fifteen minutes we were completely overwhelmed and our players looked woefully out of their depth. It’s difficult to give Sweden too much credit for finding their way into the game as it was almost entirely due to England’s careless avoidable errors. The equaliser came from a free kick given because Carroll inexplicably lunged and gave a free kick away. Defending at the free kick itself was slapdash and clumsy. The kick itself was poor and his straight into the wall. The ball was hit back into the dangerzone and, for no apparent reason, Glen Johnson didn’t push out and we were exposed. A few minutes later we feared the worst when Milner foolishly lunged at Olsson. Fears were justified when Mellberg gratefully headed home a free header. From being in control of the game we’d become a shambles. It’s to Hodgson’s credit that he had the nous to change things immediately. Theo Walcott’s introduction immediately changed things. Fortuitous though his equaliser was it boosted his confidence immeasurably. It was Walcott’s burst of pace and skill that led to Welbeck’s wonderfully improvised winner. Some of the criticism Theo has received in recent years has been over the top to say the least. Making the difference in such a big game may be a pivotal point in him starting to fulfill his considerable potential. It was disappointing to look around the internet and see suggestions that Welbeck’s goal was a fluke. If a Spaniard or Brazilian had done that we’d look on with admiration and envy. An England player does it and we try to pick fault. Give credit where it’s due. Well done Danny Welbeck!! Our players made it hard for themselves but we won the because we were incisive in the attacking third and the substitutions were good decisions. Positive changes from Roy Hodgson were decisive. Wayne Rooney will finally make an appearance in the Ukraine game. It presents the manager with the problem of who will be replaced. It’ll be a tough decision but that’s his job. To progress to the quarter final we need a draw against Ukraine in the final group game. It may seem to be a simple task but like everything with England, don’t expect it to be straight forward. That may seem excessively gloomy but there is a precedent to reflect on. http://www.youtube.com/watch?v=80hZNGOY_g8&feature=related It’s fair to say that should we reach the knockout stage the powerhouse nations have little to fear from us. It should be noted however that England have already had a better tournament than many dared to wish for. Welcome back football, my friend, my strength, my passion and of course, my eternal frustration! Over a month since the World Cup ended and Weekends are just inconsequential without you football my darling. A return to midnight (or 1am) kick offs then retiring to bed accompanied by liberal doses of fatigue and deflation. And deflation is the key word to describe the lasting effect of our performance at Wolves. After Jonesy went off injured our players joined us in the deflation collective and allowed Wolves to get over the top of us and dominate. Our inability to keep the ball combined with our players bad decisions all over the pitch led to a very, well, deflating day for us. There can be no doubt at all the first goal we conceded was a brilliant piece of skill but we have to remember our part in it. Whitehead lunging into that challenge was foolish and unnecessary. Foley was actually moving away from goal when Dean steamed in. The physical approach is part of what we do but football is a bit of everything if and when it’s needed and flying in like that was just asking for trouble. The second goal may have been slightly unlucky for us but to cling to that for comfort after a performance as undisciplined as Saturday would be to hide our heads in the sand. Even when we got the goal back we rarely showed the required energy or imagination to drag an unlikely point out. In the last minute Rory had a throw that, to the euphoric gloating of the home fans, just skidded out of his hands… an appropriately embarassing end to a bleak day for Stoke City. Ah well, upwards and onwards. Easy games to come…. Spurs and Chelsea. Will we get a point on the board before the international break? It feels like we won’t BUT, this feeling of dread is nothing a win wouldn’t put right! I wonder when it’ll be. Could it be that Capello’s comment that Beckham is too old was a joke that missed the mark? His lack of English skills render that a feasible possibility. If that’s an irrational suggestion it’s no more irrational than the media pandemonium that followed his comment. Saying that publicly before discussing it with Beckham was ill advised and clumsy but does it really merit the media examination that followed? The Telegraph declared that Capello had reached a “New low”. The News of the world solemnly announed that it’s been “One of the worst weeks of his (Beckham’s) soccer career”. Both melodramic statements which are more in line with Fabio Capello’s current lowly standing than any substantial rational coverage. The News of the World in particular should be aware of the ups and downs of Beckham’s career and that he’s had much worse weeks than this. It was after all, that very tabloid organ which gleefully printed the story of his affair with Rebecca Loos in 2004. In fact, Sunday’s comment came as they kindly told the world that his sister has had to claim benefit payments. After the 1998 World Cup Beckham had to face the prospect of an effigy of himself hanging from a roof and The Mirror bullishly gave readers a David Beckham dartboard. The England manager forgetting to tell him he’s out of future plans isn’t going to mortally wound him…. or anyone else for that matter. Spurs and Man City started the Premier League season with a fantastic entertaining game. Spurs started at an incredible pace and made their possession count by creating a sequence of excellent chances. Hart was a colossus. Surely Hart is now well and truly England’s number one keeper…. better late than never I suppose! It was a much better game than 0-0 suggests but if Spurs can maintain that level of pace and creativity to their play surely they can contend for a top four spot again. Blackpool were the romantic story of the first day of the season. Whatever else happens this season, their fans will always be able to treasure that memory, the kind of memory we all love this game for. Wigan Athletic and their fans will remember the day less fondly! The real daunting thing about Chelsea’s effortless dismantling of WBA is that WBA didn’t really do much wrong. In fact for much of the game they tried to get forward and got a few decent crosses in. That Chelsea hit six without really breaking sweat hammers out a warning to Man Utd. Talking of Man utd, I sit typing thins during their game against Newcastle and the main talking point has to be Joey Barton’s moustache! What’s he done that for? Apparently he’s refusing to shave it until they win a league game. Now that’s risky! Otherwise Rooney looks as if he’s carried his world cup form into the new season. Berbatov just scored. Aston Villa’s win over West Ham had an air of crisis what crisis? O’Neill’s decsion to go hardly the ideal way to prepare any team for the first game of a season. We can only come to the conclusiion that Villa is now a hard club to manage and Randy Lerner a difficulty man to work for. The ongoing talk of funding players and having to sell to buy and whether the Milner money would be available must have just worn O’Neill down. Can anyone blame him? Does a manager of his reputation need that kind of aggravation? Where will he work next? Will he work anywhere? All will be revealed now the emotional rollercoaster of football has returned!! Will the Dutch finally emerge from the stains of the 70s? Down the years, the ongoing style of their play has been tarnished by internal bickering creating at times laughable self induced implosion yet the elephant in the room of the collective Dutch football psyche is the memory of Munich on July 7th 1974. Even lifting the European Championship trophy (ironically in Munich) has only papered over the cracks. On Sunday they have the chance to exorcise their demons. Their style is more pragmatic than their predecessors of 36 years ago but if the post semi final euphoric scenes in Amsterdam are a any barometer they are prepared to forego that for a chance of a crack at the big one! Mind you, despite modern pragmatism, Cruyff or Neeskens would have been proud of Van Bronckhorst’s opener. If ever there was a 1-0 thrashing it was the semi final between Germany and Spain. Germany missed the forward mobility of Muller but it’s unlikely his presence would have altered the result. For minutes on end Germany just couldn’t get the ball. Pedro was important. His movement dragged the German defence out of their comfort zone. Del Bosque proved he could make the big decisions by omitting Torres from the starting line up and the decision making throughout the team was just as excellent. The real decisive factor was that all the possession Spain had, and there was plenty of it, it was all for a purpose. They played positive skillful football and played with their mind. The irony was that for all the style and skill in this brilliant generation of players, the goal came from the old warhorse Puyol from a simple a method as a header from a corner! And when Germany did press Spain didn’t just get men behind the ball… they had men behind the ball defending. There was five of them everywhere. And when it was required Casillas did his job well. Class throughout the whole team. I wonder how Raul feels seeing his compatriots making their mark on history. His nation’s rich potential only started to be fulfilled when he’d been dumped…. coincidence? Both semi finals were cracking games. Well worth getting up at 4am for!! That sodding octopus was right again. Paul is turning out to be my least favourite octupus ever…. and that’s saying something. Never mind squelching around in a tank, if he had any sense he’d be at the bookies raking the money in. What a waste of talent. It’s been a groundbreaking World Cup. The first to be held in Africa. The first time the hosts have failed to get through the group stage. If Spain win the trophy it’ll mean the only unbeaten side in the tournament will have been New Zealand. If Spain win it’ll be the first time a team has lost the first game and gone on to win the competition. And whoever wins it’ll definitely be be the first time a European team has won it outside Europe. History being made all over the place. Milestones appropriate to what has been an excellent tournament. Alex Ferguson has spoken out to say the pressure on Wayne Rooney was too high. Well it’s understandable he’s defending his player but the point has to be made that Rooney was happy to declare he was about to ‘Write the Future”. The pressure was intense but could it be any other way at an event of this magnitude? The weight of expectation may well be overpowering at times but in choosing to do those adverts, for which we can assume he received handsome financial rewards, Wayne willingly contributed to his own burden. That was better. We played with a bit more purpose and opened Slovenia up now and then. Defoe put some much needed mobility in to the forward line and he took his chance well. Fantastic cross by Milner too which was a pleasant surprise. Rooney was more involved and should have scored Rooney the chance that the keeper saved but he was looking a bit better. If he scores one he’ll score another. The defence hasn’t had the credit it deserves. Upson and Terry were rock solid. Apart from THAT moment fron Green we’ve rarely looked like conceding. The last five minutes were annoyingly tense because we should have scored another one (or two) to finish them off. When the final whistle finally blew and celebrations commenced I looked around the pub and noticed the Americans watching their game against Algeria suddenly go barmy. At first it seemed they were just acting a bit weird then it dawned on me they were going barmy because of the late winner. Afterwards speaking to some of them it dawned on me they had watched and some of them hadn’t really understood what was happening. Talk of a “Late score” and “Desperate interceptions” is unusual football terminology! Of course, that late USA goal means it’s Germany next. There’s no reason to fear anyone but it’s common sense that Germany avoidance was preferable. We may pay a heavy price for our slackness in the first two games. The dreaded penalties loom large in our collective mind. I fear our journey will end on Sunday. We usually get knocked out when we face a side with genuine aspirations to win the trophy. 1990 was fantastic but, with all respect Belgium and Cameroon weren’t contenders to win the trophy. I’d love to be wrong.